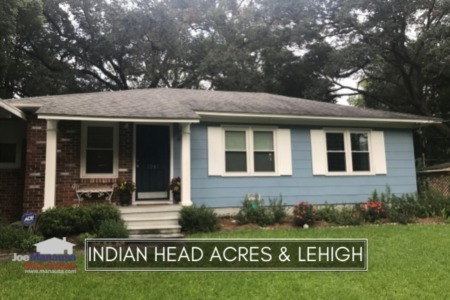 Located on the SE side of Tallahassee just south Apalachee Parkway across from the Governor's Square Mall, Indian Head Acres offers highly attractive values in a desirable downtown location. Indian Head Acres has homes built from the 1940s through the 1970s, though occasionally new homes have been built since that time. 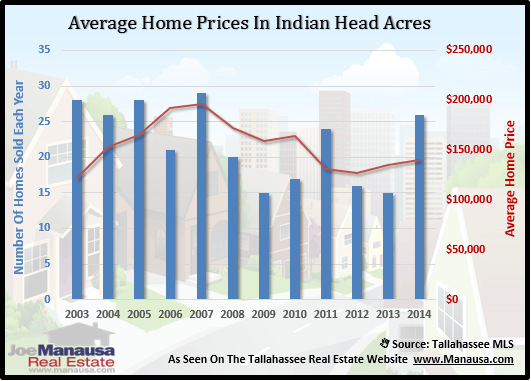 Unlike many of the "boom neighborhoods" that we have discussed in recent housing reports, a well established neighborhood like Indian Head Acres is not likely to be suffering from too much pent-up supply. This neighborhood has been through the wringer when the housing market collapsed, and it is now recovering nicely. 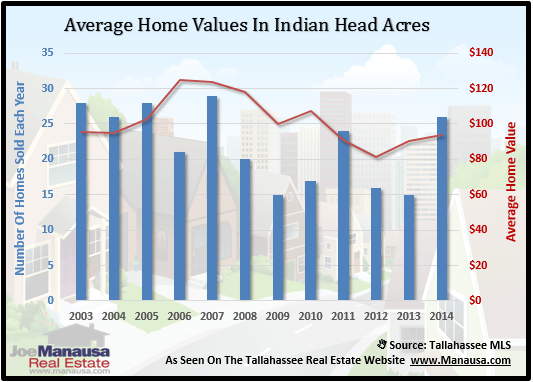 In this report, we will look at prices, values, and sizes of homes in Indian Head Acres, as well as show current listings in the Tallahassee MLS and all closed home sales going back to 2003. 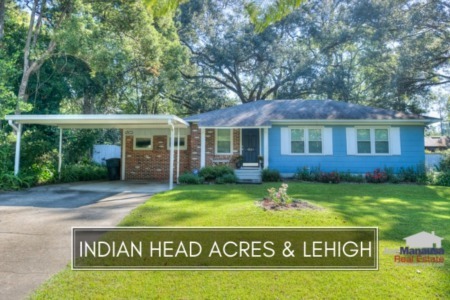 Indian Head Acres shares a website with Lehigh for neighborhood association reports, events, news, and updates. You can find the Indianhead Lehigh Neighborhood Association here. Average home prices have risen 3% in 2014 versus 2013, but still sit well below the peak of the market prices established in 2007. Distressed sales are are occurring at a rate a bit lower than what other neighborhoods in Tallahassee are seeing, which I believe is the primary reason for the apparent jump in both home values and home prices. The average recorded sales price is $139,600 for Indian Head Acres thus far in 2014. Home sales activity this year is hot, even or above the levels recorded during the most active years from 2002 through 2006. Thus far in 2014, there have been 26 closed home sales in Indian Head Acres. Average home values in Indian Head Acres have risen 4% since last year, the second year in a row to see appreciation since the low set back in 2012. Through November, the average value of a home sold in Indian Head Acres has been $94 per square foot. This is up 15% over the bottom reached in 2012, but still down about 25% from the market high set back in 2006. This means that many homeowners who have purchased or refinanced in the past 10 years are likely at zero or negative equity situations. 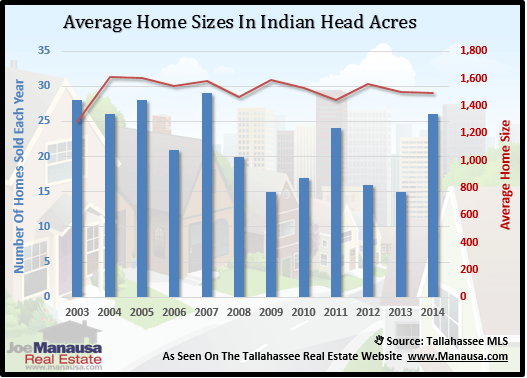 The average home size sold in Indian Head Acres typically falls in a range of 1,400 to 1,600 square feet, and this year buyers have been selecting homes right in the middle of this range. The 26 sales thus far in 2014 have averaged 1,492 square feet. The following list shows home sales going back to 2003 in Indian Head Acres. I hope you enjoyed our December 2014 update on home sales in Indian Head Acres, please feel free to drop me a note if you have questions not covered in this report.